More than ever over the past decade, geopolitics watchers whose approach to international developments is - in line with the projections made by founders of the school of thought N.Ya. Danilevsky, O. Spengler, and A.J. Toynbee - premised in the assumption that distinct civilizations will overshadow countries and ethnic groups as the actual players in global politics can say that reality is generating ample evidence to confirm the concept. The BRICS summit which convened in China's Sanya must be credited with being more than a forum of one of the countless political groups popping up across the world as countries combine their efforts in advancing common interests. BRICS – the alliance of Brazil, Russia, India, China, and South Africa – deserves to be viewed from a wider perspective, considering that every one of the member countries represents a civilizational type which is both particular and highly important on the global scale. As a result, the agreements sealed in Sanya represent a serious bid to reconfigure today's world, and the Western financial elites which seek primacy based on the US dollar and military might are confronted with a major challenge. It is an open secret that the US largely owes its own prosperity as well as the ability to support countries eager to stay in Washington's orbit to the privilege of flooding the world with dollars which, like counterfeit money, totally lack material backing. Since the collapse of the USSR, the countries which defied dollar dominance invariably came under heavy pressure and in a number of cases – under devastating attacks. S. Hussein who banned dollar circulation in all spheres of Iraq's economy including oil trade was displaced and executed and his country was left in ruins. M. Gadhafi started switching Libya's oil and gas business to gold-backed Arab currencies and air raids against the country followed almost immediately… Tehran had to put its plan to stay dollar-free on hold to avoid falling victim to aggression. Still, even enjoying unlimited US support, the financial empires built by Rothschilds and Rockefellers are powerless against the five largest civilizations represented by countries accounting for nearly half of the world's population, especially given the fact that three of them are nuclear-armed and two are already knocking on the nuclear club's doors. 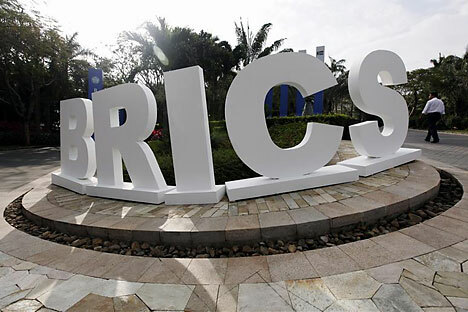 BRICS is clearly immune to forceful pressure, its member countries do not appear vulnerable to color revolutions, and the strategy of provoking and exporting financial crises may easily backfire. In contrast to the US and the EU, BRICS countries altogether own natural resources sufficient not only to keep their economies afloat in the settings of contracting availability of hydrocarbon fuels, food, potable water, and electric power but also to sustain vigorous economic growth. The shift to national currencies in the financial transactions between the BRICS countries should guarantee an unprecedented level of their independence from the US and from the West in general, but even that is only the tip of the iceberg. A grand geopolitical project is beginning to materialize, and the statement on Libya issued by the BRICS summit reflects the alliances growing determination to respond with convincing political measures if the West's expansion over the east continues. Besides, Chinese leader Hu Jintao directed biting criticism at Washington over human rights abuses, and the message is sure to resonate considering that at the moment the US is home to over 13 million Chinese whose loyalty to Beijing shows no signs of fading away. - The creation of a BRICS shared security framework. Two processes are exerting definitive influences over the current global geopolitical dynamics. On the one hand, attempts are made to establish – regardless of the imminent human costs – a unipolar world order propped up by financial and military might. Crises, armed conflicts, and various calamities are provoked with the purpose, as they are supposed to justify instituting a world government, control over which the main financial empires will easily seize. On the other hand, the contours of an alternative world order offering greater fairness, rooted in different philosophies of individual existence, and based on its own economic and social order are increasingly visible. Since individual countries and national governments are defenseless at the face of the global financial centers, civilizations have to take over the leading role in the struggle for the survival of mankind, and the advent of BRICS, along with its potential partner – the Shanghai Cooperation Organization, reflects one of the first initiatives of the kind. Interestingly, due to profound geopolitical reasons the civilizations now moving to the front stage are oriental and carry essentially non-Western values, moral norms, and forms of social organization. The alternative world order should assign greater importance to moral regards in all types of activities and prescribe collectivist rather than egoistic approaches to global and regional problems. Moderation in the use of natural resources and the taming of consumer appetites would necessarily be built into the model as well as the diversity of world views that will persist despite the pushy propaganda of the new age-type universal religion sanctioning the unipolar world order. The implementation of the underlying plans of the Sanya summit is contingent upon the BRICS' being armed with an adequate strategy and a vision of its unique long-term objectives. The mission of formulating them rests with the science of geopolitics. In China, an organization akin to Russia's Geopolitics Problems Academy has been given an official status. Similar research centers exist in India, the country which has adopted an original geopolitical doctrine. From Moscow's standpoint, the geopolitical rise of BRICS is a process which helps Russia both maintain its status in international politics and preserve its statehood and territorial integrity. We therefore wish BRICS success.